Do you sometimes just look at your floors and think, “What if?” Do they look old and tired? Or, is it just time for a change. Well, there are some really great, and relatively easy, ways that you can update your floors and bring some new life into your home’s interior. Here are seven tips to give you some ideas. One quick and easy way to hide an ugly floor is to cover it with carpeting. The carpet that’s available today isn’t the same carpet that you grew up with. It’s stain resistant, durable, and sometimes doesn’t even show those tacky vacuum tracks. The biggest advantage of having carpeting is how easy it is to keep clean. A quick vacuum and it looks as good as new. Just make sure the sub-floor is in good shape before you cover it. While you can install it yourself, you’re probably better off letting a professional do the job. Those rolls can be a little cumbersome to deal with. travertine tile, as well as many other options. Tile flooring is durable enough for any room, and it looks amazing. You can even get tile with a non-skid finish to use in areas that are prone to get wet, like bathrooms, mudrooms, or entryways. You can install a tile floor yourself or pay someone else to do it. If you’ve never done it, you can check out a few videos or read about it. It does take a little time. But, updating a floor with tile not only gives you a much more beautiful room, it actually adds value to your home. Believe it or not, you can paint your floors. Whether they are wood, vinyl, or tile, a painted floor can look amazing and will stay that way as long as you cover it with a couple of layers of a strong top coat sealer. You can paint it a solid color, add some shapes or stripes, or even use some stencils for a unique effect. There’s no end to the possibilities that you could come up with. And, the end result would be a one-of-a-kind creation. A painted floor might be something that you’d feel comfortable tackling yourself. If not, you can easily find someone qualified to do it for you. If you have hardwood floors and they are looking dull or are scratched or damaged, you’d be amazed at what a difference refinishing them will make. It is a job that you can do yourself. But, it is well worth the minor expense to have a professional take care of all of that cleaning and sanding for you. Refinishing your existing floors is also a very eco-friendly way of updating them since you are reusing the same wood instead of buying new hardwood. Check out Absolute Floor Stripping, http://www.absolutefloorstripping.com.au, for some great options for bringing your old hardwood floors back to life. Maybe, you are thinking about replacing your existing flooring with hardwood floors. It’s very doable, and doesn’t have to be an expensive project. You have a couple of different options if you want to have that timeless elegance that only hardwood flooring can offer. Solid Hardwood: The planks are cut from trees such as maple, oak, or cherry. They can be of varying widths and lengths, and can be stained with either natural wood stains or color tinted stains. Their natural beauty will enhance any room space. Installed the old-fashioned way with a hammer and nails, you can either do the job yourself or hire a professional. Engineered Hardwood: These planks are manufactured by pressing and sealing different layers of wood together. The top layers would be the desired hardwood. There are a couple of advantages to engineered hardwood. It is more durable and resistant to scratches than solid hardwood. And, it costs less than traditional hardwood. While it will give you the polished look of solid hardwood, it cannot be refinished in the future, if needed. 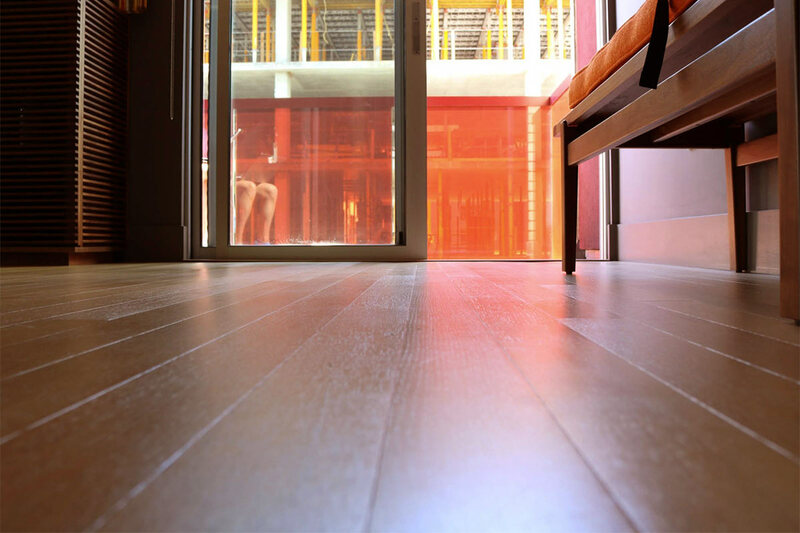 Engineered hardwoods are connected together with a tongue-and-groove method and glued to the sub-floor. The installation can either be a DIY project or you can hire a pro to take care of it. Most sub-floors are made of plywood. One very economical way to update your floors is to remove your current flooring and take advantage of the plywood underneath. You can actually create a stunning look by either staining or painting the actual plywood and using it as your floor covering. Again, you get points on the eco-friendly scale. And, you get a beautifully unique floor covering. Depending on your level of painting expertise, you could tackle a project like this or find a good floor painter. Here’s another one that you can have some fun with. If your sub-floor is made of concrete, expose it. You can stain it, paint it, or even polish it and go with a true industrial look. There are even acid staining techniques that can really make the floor pop with life. The intricacies of working with concrete, especially acid techniques, would be better off in the hands of a professional. The main thing about updating your floors is to pick something that will not only look amazing, but will also be easy to maintain so it stays beautiful longer. These are just a few of the different things that you can do to give your floors the new, updated look that you are looking for. So, have at it. And, have some fun while you’re doing it.